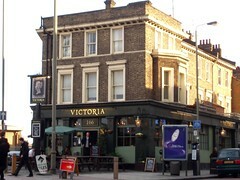 A pub on Queenstown Road in Battersea. This is a refurbished former locals' pub which still packs people in for big football matches (it was completely rammed on one Saturday visit in September 2009), but is less hectic at other times. Even when the sports are showing, it doesn't feel unpleasant; service is very friendly. There's plenty of seating inside, with several different partitioned areas, and a variety of couches and bench seating and some large tables. There's an area down the back with a pool table. There are also some picnic-style benches outside alongside the road. At the bar are four handpulls, dispensing Old Speckled Hen, Doom Bar, London Pride and Adnam's East Green on an August 2009 visit. Heineken is also on draught, and they have a few bottled German beers as well. Food is served, and for the portion sizes, the prices are good value and the ingredients a bit more interesting than the standard pub options while fitting into these broad categories (there are still salads, pies, fish & chips and the like) photo of menu in August 2009. Ewan's wild mushroom & asparagus pie (£9) was pretty reasonable, and came with some chunky chips photo. Jo's roast butternut squash salad with halloumi, red onion and chickpeas on chard (£6.50) was more impressive even, and great value photo. A return visit in September 2009 verified that the pine nut burger (£8.50) is pretty huge but also rather tasty. Last visited by Ewan, Jo and Andrew, 12 September 2009. Last edited 2013-05-10 08:12:36 (version 3; diff). List all versions. Page last edited 2013-05-10 08:12:36 (version 3).